Special thanks to Iconic Hotel for extending this food review invitation. Iconic Hotel is a business hotel at the southern end of Icon City. In fact, Iconic Hotel is the only hotel of such size in this part of Seberang Perai. The hotel is owned and managed under the same company that developed Icon City. Mezza9 and Crumbles & Cream are the two eateries in Iconic Hotel. The former is the hotel's primary coffeehouse and is also where guests are served breakfast. The name "Mezza9" refers to the fact that the hotel is located on the mezzanine floor. 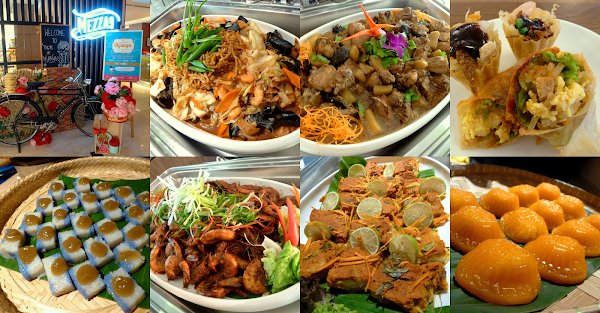 Starting this month, Mezza9 is serving Taste of Nyonya Buffet Dinner on Friday and Saturday evenings. The menu covers a wide range of Peranakan (Nyonya) dishes, including those from Penang and Malacca (Melaka). To date, Iconic Hotel is one of the two hotels in Penang which serves Nyonya-themed buffets on recurring basis. Popiah (薄饼) is one of most recognizable Nyonya snacks. The dough skin is extremely thin and is somewhat tricky to make. The skin needs to be cooked in a steamer in order to preserve its desired chewiness. Popiah is filled with ingredients such as jicama (sengkuang), carrots, bean sprouts, fried egg, lettuce, chopped scallion, fried shallots, chili paste and sweet sauce. The mixture of juicy ingredients makes the roll appetizing indeed. Another related Nyonya snack is Pie Tee (小金杯). Instead of soft dough skin, Pie Tee uses crispy tart shells. Other ingredients of Pie Tee are identical to Popiah except for the inclusion of shrimps in the former. Nyonya Fruit Rojak is a fruit salad which comprises of jambu batu (guava), jambu air (rose apple), jicama, belimbing (starfruit), pineapple, mango and apple. The salad is dressed in rojak sauce that is prepared from belacan (fermented shrimp paste). Light sprinkles of crushed peanuts and sesame seeds help to improve mouthfeel. Jiu Hu Char (鱿鱼炒) is essentially a mixture of dried cuttlefish with shredded jicama. The savory taste of cuttlefish is complemented by juicy texture of jicama. Jiu Hu Char is customarily wrapped in lettuce before being eaten. As for soup, Kiam Chye Ark Thng (咸菜鸭汤) is stewed from duck meat for several hours until the soup becomes saturated with savoriness. Meanwhile, the soup's saltiness comes from pickled Chinese mustard (芥菜). Ayam Pong Teh is a Nyonya delicacy from Malacca and is not so common in Penang. To prepare this dish, chicken, potatoes and shiitake mushrooms are stewed with fermented soybeans (豆瓣酱). Udang Goreng Assam (亚参虾) is appealing to diners who enjoy the sweet-tangy taste of tamarind sauce. Shrimp heads are removed prior to cooking. Up next, Otak-Otak is a spicy mixture of ground fish meat, tapioca starch and a variety of spices. The soft, delicate mixture is typically wrapped in long sheets of nipa palm leaves. The wrap is stapled on both ends, and then barbecued over flame. One of my favorite dishes this evening is Telur Dadar Cincaluk. Fried egg is flavored with a special condiment called cincalok, which is a local specialty in Malacca. Made from fermented shrimps, cincalok is quite salty on its own. Fortunately, its marriage with omelette tones down the level of saltiness to an acceptable degree. For something lighter on the palate, Nyonya Chap Chye (娘惹杂菜) is a sound choice. There is no fixed recipe for this dish because it is usually meant as a way to utilize leftover vegetables in the kitchen. In this case, the mixture of vegetables is cabbage, carrot and wood ear fungus (黑木耳). Several shrimps are also added. Whenever it comes to Nyonya food, I am always eager to get my hands on Inchi Kabin (胭脂鸡). To prepare this dish, chicken is marinated with coconut milk and spices, and then deep-fried to golden perfection. Unfortunately because the fried chicken has been left out for a while, this dish is noticeably drier than its ideal state. When it comes to rice, Nasi Ulam Istimewa fills this role neatly. Steamed rice is cooked with a mixture of herbs such as daun kaduk (wild betel leaves) in particular. With the perfect composition of rice and herbs, this rice dish is delightful in terms of aroma and taste. Lor Bak (卤肉) is traditionally made from pork, but Mezza9 substitutes pork for chicken in compliance with halal regulations. Minced chicken is seasoned with five-spice powder (五香粉) to impart savory flavors. Chicken is then wrapped in tofu skin (腐皮) and deep-fried until the roll becomes crispy. Also delectable is Kerabu Mangga, a cold salad dish that is made from julienned mango and other vegetables. Hailing from Indonesia, tempeh is a delicacy made from fermented soybeans. But unlike tofu, tempeh does not require soybeans to be converted to soy milk. Tempeh is used in a variety of Indonesian dishes including gado-gado. Nyonya Acar, also known as Acar Awak, is a salad mixture of julienned carrots and cucumber with copious amounts of crushed peanuts and sesame seeds. Nyonya Acar is best served chilled. This evening buffet includes several non-Nyonya dishes such as Pasta Au Gratin. For this dish, pasta is baked and served in a shallow dish. The top surface is covered by a layer of browned cheese crust. The aroma of Butter Prawns is at its zenith when the dish is served hot. At the action counter, Ikan Bakar is prepared using seafood namely butterfish, squid and shrimps. Seafood is grilled inside pockets of aluminium foil to retain their moisture. Since food is cooked to order, expect to wait for 20 minutes or so before being served. The action counter also includes Goreng-Goreng: deep-fried banana, sweet potato and cempedak fritters. Pengat Durian has similar consistency as the more common Pengat Pisang. Durian's presence in the soup is most pronounced in terms of aroma, but the subtle sweetness of durian is enticing too. Pengat Durian can also be eaten with Pulut Serawa Durian, which is essentially steamed glutinous rice balls. Bubur Cha Cha is yet another essential entry in Nyonya recipe books. This sweet dessert is made from coconut milk and miniature sago pearls. Diners have the privilege of customizing other ingredients: banana, taro and 3 types of sweet potato. Besides Bubur Cha Cha, Bubur Pulut Hitam is also available. One of the most popular Malaysian desserts is Sago Gula Melaka. The sticky jelly-like pearls are made from sago, a staple crop which only grows in Southeast Asia. Tasteless on their own, sago pearls are almost always eaten with gula melaka (palm sugar) and coconut milk. Chai Kueh (菜粿) is a steamed dumpling filled with garlic chives, while the outer layer is made from soft dough skin. Unlike Popiah, Chai Kueh is much thicker and is quite sticky. Although Chai Kueh is meant to be eaten with sweet chili sauce, I personally prefer not to add any. Ang Koo Kueh (红龟粿) literally means "red tortoise cake" in Hokkien. The sticky pastry, made from glutinous rice, is deliberately dyed red because the color is considered auspicious in Chinese culture. In addition, tortoise is believed to bring longevity to the family. As per tradition, Ang Koo Kueh is filled with sweet mung bean paste. Made from wheat flour and tapioca starch, Kuih Lompang comes in many colors but it is often dyed green or brown. The steamed pastry is shaped like a small cup with an indentation at the center. Grated coconut is added to the top. In fact, the Malay word "lompang" means "indent". Next on the pipeline of Nyonya kuih is Pulut Tekan. Glutinous rice is dyed blue using bunga telang (butterfly-pea flower) extract. Rice grains are pressed into compact blocks and then steamed. Since the rice cake is nearly tasteless on its own, it is served with kaya (sweet coconut jam). The yellowish cake is known as Kuih Bingka. Comprising mostly of tapioca starch, the cake also contains eggs, coconut milk and pandan leaf extract. After baking, the cake's outer surface turns brown. Still in the realm of glutinous rice, Pulut Inti is flavored with grated coconut and gula melaka. Pulut Inti is often served in a banana leaf wrap in order to enhance its aroma. Cream puff is called "profiterole" in France. At Mezza9, this French pastry is fused with an exotic fruit. Not just any fruit, but the king of all fruits: durian. While the puff pastry remains similar, the creamy custard inside is flavored with sweet durian flesh. The Durian Cream Puff certainly appeals to the mainstream Malaysian palate. Apart from that, the desserts counter also covers a wide assortment of French pastries. The cakes are cut into bite-size pieces for the convenience of diners. This evening's meal concludes with a cup of coffee from the espresso machine. Iconic Hotel uses coffee beans roasted by Boncafé. The coffee's aroma is rather modest, but it has surprisingly strong flavor. Taste of Nyonya Buffet Dinner is served every Friday and Saturday from 7:00pm to 10:00pm. The price is RM78.00+ per adult and RM39.00+ per child. For every 3 paying adults, the 4th person dines for free. In lieu of this offer, diners can also turn up in traditional Baba or Nyonya costumes to get 25% discount off the bat. Directions: From the North-South Expressway, take the Bukit Mertajam exit and head east. Turn left just before Petron gas station, then turn right to the front entrance of the 15-floor Iconic Hotel. Mezza9 is located on the Mezzanine Level of the hotel. The hotel provides multistorey parking.